We are so stoked to be part of the first edition of Urban Sports Week Amsterdam! 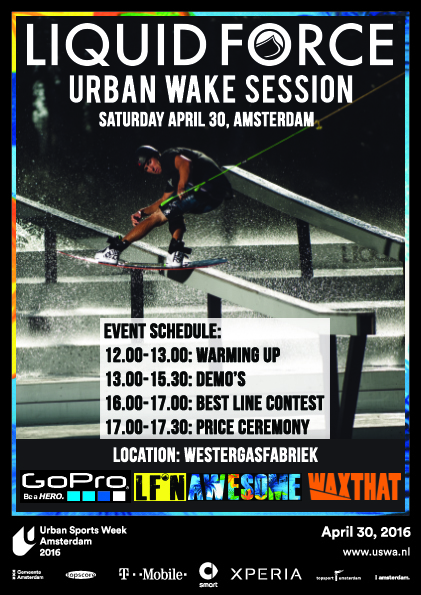 During USWA on April 30 Liquid Force Urban Wake Session will kick off with wakeboarding next to the Westergasfabriek in Amsterdam! Invited pro wakeboarders will show off their tricks with demo’s in the urban winch park and end the day with the ‘Best Line’ contest. Free entree for everyone, so come along and drink a beer with us at our WAXTHAT stand with all the new goods!